Sometimes you might need your application to behave differently according to different clients, or different operating systems, or any other criterion. You could create global variables, initialize them on your application’s startup, and scatter if statements over your code. What you should do is use the “State” design pattern instead, but for little and localized differences that might be overkill. 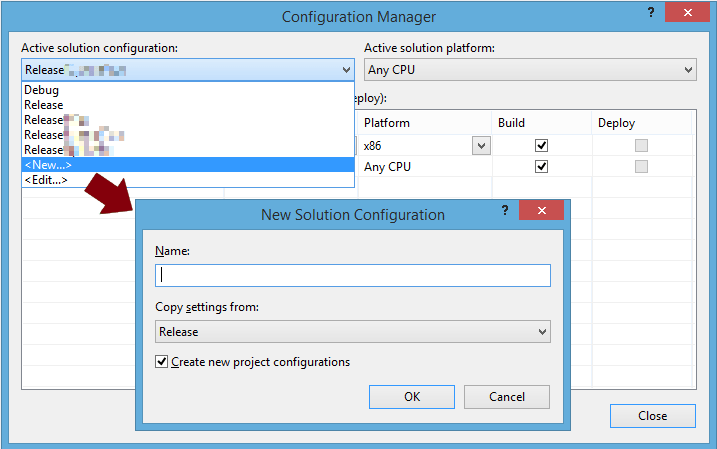 The lean solution is to use VisualStudio’s build configurations. They offer more flexibility, improve code readability, and ease debugging. Under the hood VisualStudio also uses state variables and if statements, however it abstracts most of those implementation details from the developer. Tell the compiler when to use that build configuration, using the #IF directive. You can view and select build configurations from VisualStudio’s top toolbar. 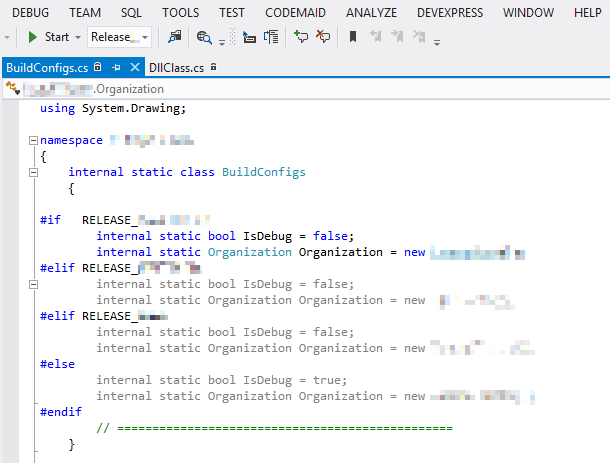 Every C# project comes with a Debug and a Release configuration. When you select one you’re telling the IDE to compile differently and behave accordingly. Let’s create your first custom build configuration. Imagine this scenario: you have two clients (ABC and XYZ) and you want your software to behave differently for each one. Therefore, besides Debug and Release you need two additional configurations: Release ABC and Release XYZ. Since these last two build configurations are production-ready, you will copy the settings from Release. Now go to your project’s Properties and select the Build tab. 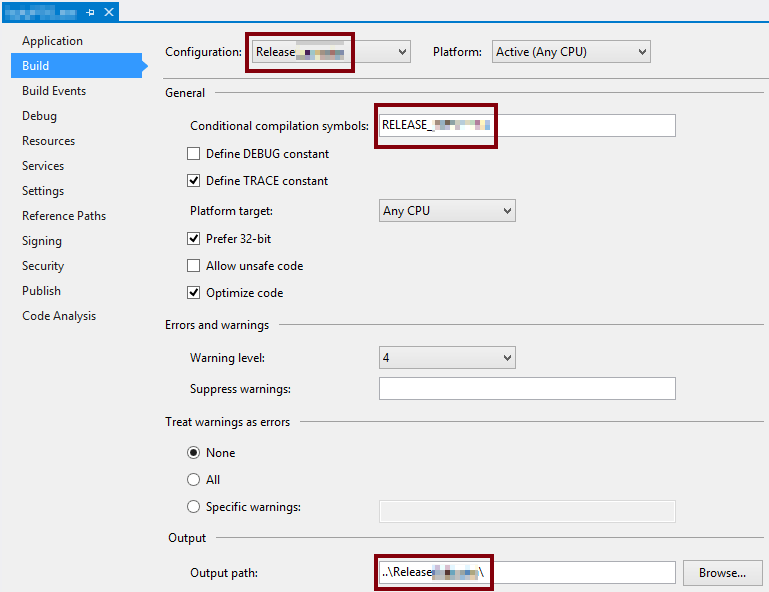 Select your newly created setting Release ABC from the Configuration combo box. Configure it as your wish, making sure you define a Conditional compilation symbol. My convention is to use the configuration name in upper case, like RELEASE_ABC. I also advise you to specify a different Output path — that way, the next time you build your project, each client’s binaries will be automatically placed into different folders. Save your changes and you’re ready to use it on your code. The conditional compilation syntax is #IF <CondCompilationSymbol>, #ELIF <CondCompilationSymbol>, #ELSE, and #ENDIF. Do you want some code to run only during Debug? VisualStudio will grey out the lines of code which won’t be executed according to the current build configuration. That helps a lot during coding and debugging.